The Fourth World Communication Forum in Davos “Communication on Top” was held on 7-8 February, 2013, again in Davos Congress Centre, Davos Platz, Switzerland. It summoned a great number of participants from nearly 30 countries! The forum welcomed for the first time PR and communications professionals representing the industry in Hungary, Poland, Denmark, the Czech Republic, Malta, China, Estonia, and Ukraine! The event focused on “Local vs. Global” and “Social vs. Traditional” PR and business communications. Hot topics were also the “Viral change”, “Trust of millions”, and “Copy vs. Image” in today’s digital reality. The forum welcomed top professionals from the PR and Corporate Communications industry around the world and provoked valuable comments and suggestions, shared by partners and guests! 1) Global VS Local: a key issue widely discussed at the event. Attendees and online monitoring professionals recognized a very important trend of the modern communications industry - it is getting more honest. Today people and businesses alike need true and involving communications, and that is what local agencies can provide. However, they still seem to lack the valuable global expertise, neither do they match the requirements of global companies communicating universal values worldwide. How should the dilemma be solved? Paul Holmes, the PR industry guru, advised: Move from base to upper levels > create good local agencies and unite them into efficient networks. 2) The Viral Change was raised as a due topic by Dr. Leandro Herrero. So far we have always been trying to communicate how people should behave... That was a mistake. Behaviours spread only because they are copied, not because people are advised on how to behave. Which immediately provokes the question of managing cultures and communities - who is to be trusted as a good example to follow, and how actually changes within the corporations should be conducted. 3) Digital marketing as opposed to the PR market was discussed in terms of value and monetizing, yet the forum audience managed to “marry” these two, since it was unanimously agreed: the actual trend is not about getting digital, but rather about getting social. 4) Media today - another topic that raised attention. Digital media is the space where people dwell nowadays, so our next challenge is to closely study their behaviour and be prepared where to input most efforts. For instance, even today there are still communicators unaware of the fact that 90% of the internet activities actually start with web-searching. In other words: being thererequires staying alert. 5) Reputation management - is it possible? Lately, businesses more often face the necessity to manage reputations from inside. People - employees - are becoming a major reputation risk. HR and internal communications should thus collaborate more efficiently with PR in order to safeguard the company reputation. 6) Impact of professional awards. As awards strongly influence the market standards, they have to be categorized in a way that helps to reflect the industry relevantly enough: not necessarily by professional areas, but, as suggested at the event - by the effect a campaign or a person has had on the respective audience. Besides, an award should choose either one or the other approach, and then stick to it, awarding those who meet the standards, or rather - those who set them. 7) Start-up communications differ from other types of business as they have to dig the track for a new product or service, i.e. - they need to sell an idea. Hence, this type of the industry is strongly dependant on professional, flexible, creative, and smart communicators. That is why it opens a vast range of opportunities to the professional community, yet we need to gain specific expertise in order to make best use of the situation. 8) Place branding. This relatively new kind of branding stays apart, as it deals with brand stakeholders rather than with consumers. In this particular area communications get decentralized only to become better distributed, which opens new challenges for the managing team. Untraditional approach is more and more required for the creation of a successful brand and research has naturally become the larger part of the process, its creative phase being reduced to simply translating insights about the place that are already shared by local people, and shaping them into words and images. Telling stories to communicate the brand is another tool yet to be mastered. 9) Public relations in the energy sector are facing the challenge of communicating new sources of energy that are still at the point of gaining trust. One of the issues discussed was the necessity for Nuclear Energy transparency and openness. Social PR and social media allow people to get involved with the scientific/energy process, thus providing a very powerful new tool and allowing the companies to tell the story in a comprehensive way. Society needs to be better equipped in order to make important decisions about future energy choices, and for that to happen, the scientific community should make an effort to engage more strongly with the society. 10) Will images replace texts in future communications? While trying to predict the tendencies, the experts at the event talked about the necessity for a better understanding of the way the human brain works. However, the prospect of getting rid of words as the key means of conveying messages and meaning seems rather unlikely in the near future. In short, as Dr. Alfred Koblinger very well put it – copy is the dumping ground for everything we “must” say, and only words can deliver Trust, Reliability, Authenticity, and Relevance! Sincere gratitude to the main partners supporting the 4th edition of WCF-Davos: CROS Public Relations & Public Affairs Company - Partner of the Key Debate "Global vs. Local Communications", DIN Forums Network - Partner of the session "Media toda: synergy or confrontation? ", Lubri Oil Corporation (M) Sdn Bhd - Partner of panel discussion "Trust of millions & Energy", Russian Venture Company (OJSC) - Partner of panel discussion "Communications for Start-Ups", XXI Century Dictionaries - Partner of the C4F-Davos Awards ceremony and Gala Dinner, and Davos Klosters - host of the event! Many thanks also to the brand-&-visibility partners of the forum: M3 Communications Group - web design and visibility provider & developer, Depot WPF - brand and identity provider, Webiring - live broadcast partner, Omyconf! - network platform provider, Evenium - online registration partner. WCF-Davos’2013 secured key partnerships with top international organizations: International Communications Consultancy Organisation (ICCO) - the voice of public relations consultancies around the world with 1500 PR firms from 28 countries across Europe, Africa, Asia, the Americas and Australia, IAB Europe - the largest EU federation with over 5000 members from 30 countries,Public Relation Consultants Association (PRCA) - with over 300 agency members from around the world, including the majority of the top 100 UK consultancies, and also: the Association of PR Agencies in Switzerland (BPRA), Brazilian Association of Communication Agencies – ABRACOM, Association of Business Communicators of India (ABCI), Ukrainian Association of Public Relations (UAPR), Russian Public Relations Association (RPRA), Serbian Society for Public Affairs (DZOJ), Korea Public Relations Consultancy Association (KPRCA), Mexican Association of Public Relations Agencies (PROPR), Russian Association of Communication Agencies (RACA), and all of our other partners: Partners' Page'2013. Special thanks also to Alexander Mitev and AlexStudio, BG - for the professional camera and secured photo-records of the event. WCF-Davos’2013 was broadcast LIVE in real time - on the front page of the official forum website, and actively monitored by online followers via the official TW hashtag and FB page! The forum created a buzz with immediate photos and quotes reflecting key messages of the debates and discussions, shared on the hashtag, the Twitter account, and the WCF Facebook page! Presentations are uploaded on the forum website: Presentartions’2013. 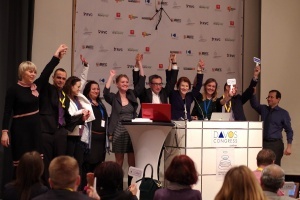 Photo records can be found in the Image Gallery of WCF-Davos. Video clips are getting published every 2 weeks on the WorldCommForum Davos channel. "I think the organizers have done a tremendous job! Very best wishes!" "Thank you very much for everything! Thank you for your patience and positive energy - I am very glad that I had the possibility to meet Yanina and the other organizers. Thank you for the great photos!" "Everything was wonderful, location was beautiful, logistics superb and very actual content - I suppose I would easily become your frequent visitor! The Forum is really fantastic! I arrange a conference we have had in Russia for the last 13 years, so I know how difficult it is and I know you need to work 365 days a year to create the next forum... Unfortunately, I could not participate in the previous editions, although I was invited, but I heard a lot of comments from those who attend every year - they all say that particularly this year the quality of content is even better. In terms of organization, I would like to thank the whole team, because you are really doing a great job! I wish you all the best!" "Thank you so much for sending the pictures and, once again, for the invitation and your hospitality! It was great to be part of the event this year and to meet you, and so many other interesting people, in person!" "Thanks for organising a fantastic WCF 2013 - was great to be part of it!" "It was a great conference, stay in touch and looking forward Davos 2014. We have already started the promotion on the Forum among Hungarian professionals. Once again thanks for the great Forum!" "Congrats again for putting on an excellent event that gets better and better each time!" C4F (Communication for Future) Davos Awards played a key part in the event. The motto See the future, and the future will see you! again proved its validity. The special award ceremony is annually held, with the intention to express recognition to outstanding communicators with creative approach, revolutionary visions on the future and impact on the development of the communications industry. To learn more details, you are welcome to visit the C4F Davos Awards’2013 page. The First Regional Session of WCF in Moscow was held on 15 March, 2013! To learn more, please visit http://www.forumdavos.com/regional.